Happy Valentine’s Day! This year, we at Shopilly are head over heels for Target’s latest designer collaboration—a 92-piece capsule collection of oh-so-lovely dresses, colorful separates and winsome accessories by NYC designer Prabal Gurung, which launched earlier this week. Inspired by a love story, the collection, simply called “Love,” features romantic ruffles, bright, futuristic florals and sweet silhouettes for every stage in a courtship, from the Floral Crush dress to the First Date tank to the Meet the Parents skirt. What we love most? Almost everything is priced under $50 (swoon!). The launch of the collection helped kick off New York fashion week with a glamorous, over-the-top carnival on Pier 57—complete with a merry-go-round, fortune teller and stars like Carey Mulligan, Elizabeth Olsen and Rashida Jones milling around in his chic Target threads. And while Olivia Thribly may be the official face of the campaign, a slew of other famous faces (such as Zoe Saldana, here) have already been spotted around town donning his darling designs. 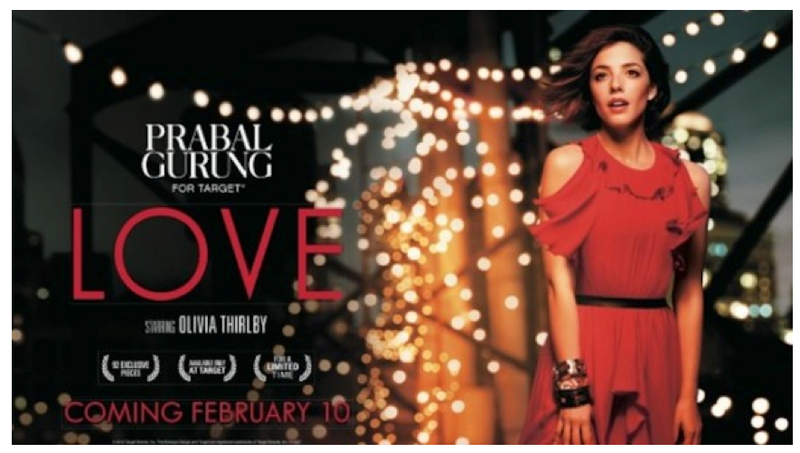 This entry was posted in Fashion, News and tagged Floral Crush, Meet the Parents, Prabal Gurung, Prabal Gurung for Target, Target by BIRDY GREY. Bookmark the permalink.